Most of the investment account pages on our site discuss retirement vehicles that are either set up between an employee and an employer (like a 401(k)), or directly between a wage earner and their financial custodian (like a Traditional IRA). Annuities, on the other hand, don’t fall into either of these categories. Annuities are offered by insurance companies, and act as an arrangement between you and the company to provide a source of income in retirement. If you have an annuity, or are considering purchasing one, this page can only offer a brief overview of generic annuity functionality and the ways in which precious metals can be used to create a well-diversified retirement strategy. You should carefully consider all of your retirement options before buying any complicated financial instrument. Below you’ll find a breakdown of some different kinds of annuities, their differences from other retirement accounts, how precious metals investing works, and how you can safeguard your savings against stock market or currency collapse. What is an Annuity and How Does it Work? In simple terms, an annuity is an insurance product which can be used as a tax-advantaged investment vehicle and eventually pays out income. While there are lump-sum annuities (usually funded by rolling over another retirement account into an annuity product), most annuities are funded by making periodic payments into an investment portfolio offered by the insurance company. Years later, the owner of the annuity receives payments from the annuity in either monthly, quarterly, or lump sum payments. Most annuities offer tax-deferred growth on earnings, much like an IRA. These tax advantages mean that annuity products are regulated by the IRS, although many rules are different than with most retirement vehicles. One obvious advantage that an annuity offers is that there are no contribution limits. This allows forward thinking investors to potentially stock away far more money towards their nest egg. Some annuities even guarantee a certain growth rate on investment products, although there are fees associated with these services. Annuities can also be established regardless of any other accounts an investor may have open. Annuities are rather well known for having high surrender charges and high annual fees, although this is more or less true depending on the type of annuity chosen. Annuities are also sold on commission, which means that a portion of the funds that are used to purchase the annuity never reach the account. The technical scope of different annuity offerings is enormous; generally, however, there are three types of annuities — fixed, indexed and variable. The type of annuity that you own affects the types of investments, payouts, fees, and regulations that come with the product. Fixed annuities offer a set, predetermined, and (usually) inflexible retirement benefit to investors. In a fixed annuity, the rate of interest on the account is set from the beginning and does not change based on the market performance of the insurance company's underlying investments. Indexed annuities set the interest rate return on the account equal to a popular market index, such as the S&P 500 Composite. Thus, if the S&P 500 returns 8 percent on the year, the annuity would likely grow at 8% as well. There are usually both minimum and maximum returns placed on indexed annuities. Variable annuities are actually considered securities and are regulated by the SEC. With a variable annuity, the owner chooses to invest from a range of different options, most of which will be mutual funds. The performance of those underlying investments will determine the return on the annuity. There are other types of annuities, and hybrids between all of the above options. All of the above can either be immediate annuities, where the owner receives benefits right away, or deferred annuities, where payments must be made for a certain number of years prior to any payouts. Can Annuities be Rolled Over or Transferred into an IRA? It is possible to transfer an annuity into an IRA, although the process for doing so depends on where the annuity was held and how much value is in the annuity. If the annuity was previously a part on an IRA or a pension (which some qualified accounts allow for), the transfer acts like any other qualified transfer. These transfer can occur only once every 365 days, but can be completed without any tax penalties. Even if there are not tax penalties, the insurance company may charge you a substantial fee for the transfer, so it is important to check the contract. Most annuities are not part of qualified plans, and those transfers are more complicated. If the annuity balance is over $5,500 — the 2014 limit on annual contributions into an IRA — then a complete transfer is not possible. Partial transfers are possible through an early surrender of funds, but those will likely incur surrender charges from the insurance company as well as early withdrawal penalties from the IRS if you are under the age of 59.5. Some companies do allow for up to a 10 percent penalty free withdrawal however, so check for that. After all forms are filled out, penalties paid, and the money is received, it can then be used to open an IRA. "Maybe" indicates that gold investment options are at the discretion of the plan provider. For example, certain 401(k) plans offer gold mutual funds or ETFs, while others do not. Gold investment options vary depending on the type of annuity. In short, only variable annuities provide the ability to select specific investments like stocks, mutual funds, and ETFs, although it is conceivable to have an indexed annuity that is fixed to a gold index. Nevertheless, you cannot invest in physical gold bullion (or any other approved investment metal) through any type of annuity product. The simplest way to invest in gold through a variable annuity is to purchase stocks in gold mining companies or to purchase a mutual fund that includes mining company stocks. 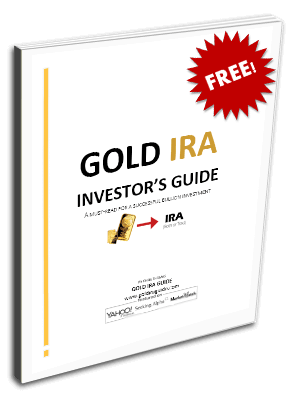 This strategy is referred to as buying “paper gold.” There are also gold ETFs (GLD) and mining ETFs which provide indirect access to gold investing. So-called “paper gold” stocks are the shares of companies that mine, produce, and explore for gold ore. There are literally hundreds of gold stocks to choose from, and the larger companies are listed on major gold indices like the Gold Miners Index (GDX) or the BUGS Index (HUI). Gold stocks tend to be more risky than owning physical gold. This is because, historically, gold stocks will appreciate quickly when gold spot prices rise but fall much more dramatically when the price of gold declines. Regulatory Risk – mining and exploration companies are subject to increased regulation and taxes. Cost of Production Risk – mining equipment depreciation, rising land values, labor cost increases, etc can all negatively impact a mining company’s valuation. Management Risk – mismanaged or overly leveraged companies can, and do, declare bankruptcy or close shop completely. Fiat Currency Risk – when you sell securities like gold stock or shares of gold mutual funds, you are going to be compensated in a fiat paper currency. In the even of currency collapse, you may be left holding a worthless asset. The value of physical gold has never hit zero and has retained value for thousands of years. In terms of staying power, physical gold beats “paper gold” hands down. Gold investments are a simple, safe way to diversify your retirement portfolio. Gold (along with other investment metals: silver, platinum and palladium) will help to protect your assets against stock market volatility and inflation. Not only is gold a great hedge, but gold offers plenty of growth potential. In fact, many investors purchase gold for its growth prospects, and many analysts predict gold to continue to see gains in the future. The total amount of precious metals in your retirement portfolio will depend on your own risk tolerance and retirement horizon. One of the best ways to set up a diversified retirement portfolio (and receive tax benefits) is to open a self-directed IRA. Thanks for the post. Gold is great asset of doing business. But there are different forms of gold when choosing gold.. We recently wrote on different forms of gold in GESOCO. Hopefully it will be helpful for you.